No-one saw it coming… Not when Caprica City was hit, not when over 28 billion people from Leonis to Aerilon were wiped out in the blink of an eye. It was always a possibility in the back of everyone's mind - despite decades of silence - yet in the 40 years since the armistice was signed, the 12 colonies had become far too complacent. 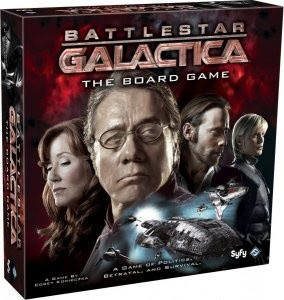 The stakes could not be any higher in Fantasy Flight Games' brilliant adaptation of Scy Fy's cult classic: Battlestar Galactica: The Board Game. This tabletop experience expertly harnesses the feelings of paranoia, pressure, and fear eating away at the crew of a fugitive vessel - on board which enemies in disguise patiently dwell, waiting to be triggered. 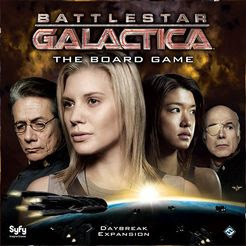 It's obvious that game designer Cory Konieczka was at least partially inspired by the 2005 board game Shadows Over Camelot, however, when developing a game based on treachery, there is no more suitable theme than BSG. Depending on the number of players (3-6), a carefully compiled deck of Loyalty Cards is evenly distributed at the start of the game - once character roles have been chosen. 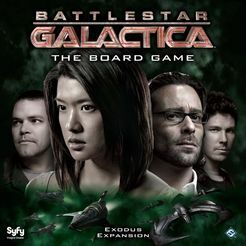 This deck determines which players are human: fighting to lead the fleet to the ancient planet of Kobol (where the directions to Earth supposedly rest), and which players are Cylons in human skin: hell-bent on eradicating their former masters from within the shadows. 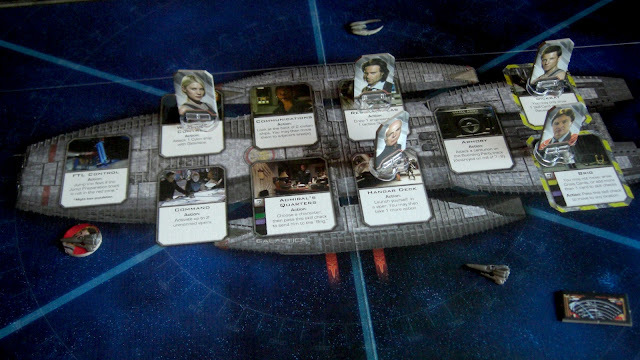 Each playable character (Adamas, Starbuck, Chief Tyrol, and Baltar all included) has a unique set of special abilities and skills based on their characteristics in the show: Abilities may be used either as a player's singular action for the round, or to help resolve a crisis that arises at the end of each player's turn. Be careful though, as each character has a weakness or two as well. Galactica itself is a fully operational battle station complete with all of the prominent branches featured in the show: Players can take command of the Brig, the FTL Control, and others as their lone turn action as well - and execute the area's corresponding function if needed. 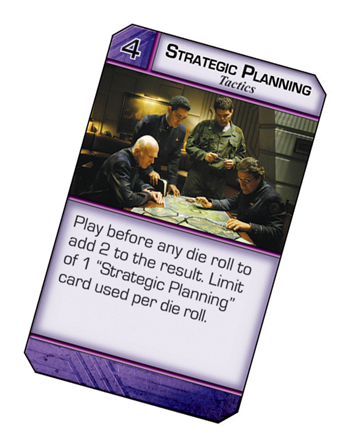 There are five skill decks: Leadership (Green), Politics (Yellow), Tactics (Purple), Piloting (Red), and Engineering (Blue), from which a character draws their pre-determined amount of cards at the start of their turn. (Skill Cards are loaded with even more unique actions to be strategically played during the round.) The role-play element associated with skills is fantastic here, as playing the Chief yields a specialty in Engineering, while Starbuck and Helo are the glory-chasing pilots. The contrasts go on, but if you thought the layers of strategy stopped there you’d be fracked. The roles of President and Admiral are assigned at the beginning of the game based on which characters were selected to play - and following a predetermined line of succession based on rank. As the political leader, the President has access to the Quorum deck. This deck is an additional set of action cards that have political ramifications on the game - as well as the ability to board Colonial One and utilize additional actions there at any time. 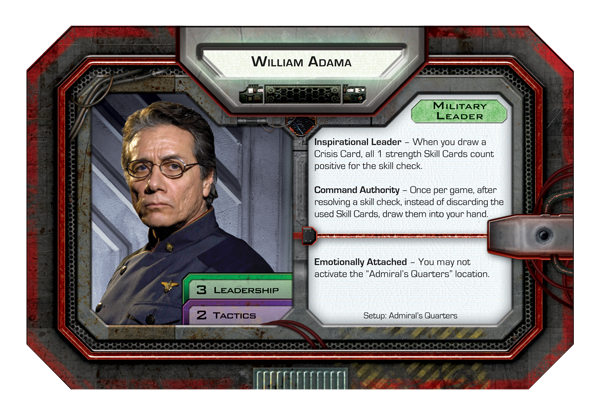 As the military commander, the Admiral has access to the final two nukes on board Galactica: A dire solution when every other option has run out against attacking Cylon basestars. 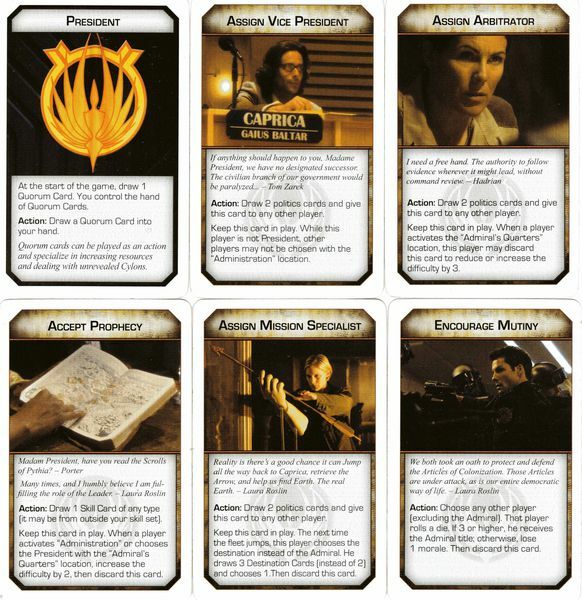 These roles can be reassigned at any time when a player holding the title is condemned to the brig, or an election is called from the press room on Colonial One - a maneuver that may just be designed to place control of the Quorum (and nuclear weapons) right into the hands of a Cylon in disguise. 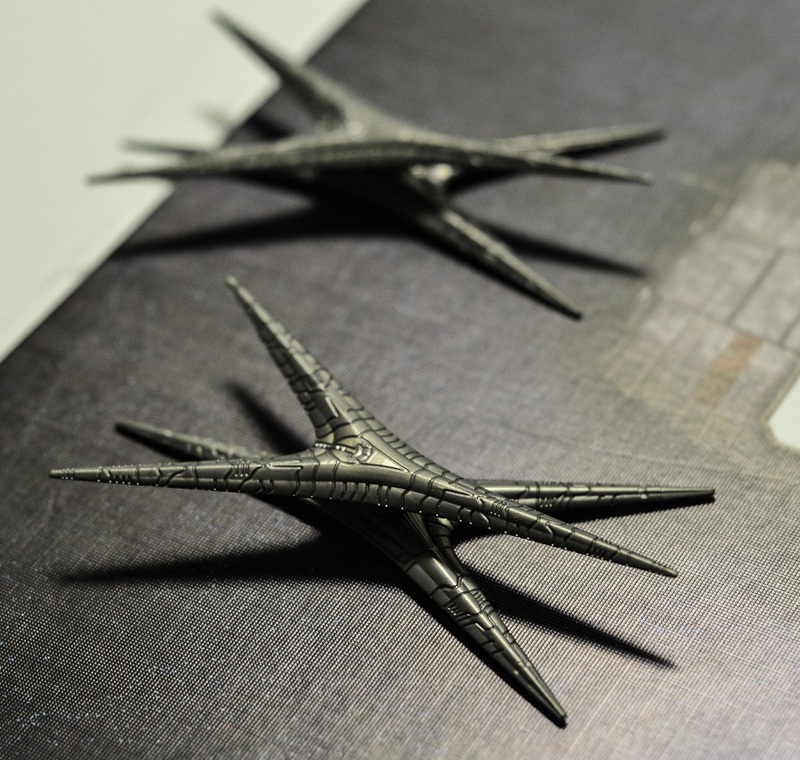 A Crisis Card is flipped and resolved every time a player takes their one action for the turn: These crisis scenarios are a great homage to the costly struggles plaguing the fleet throughout the series, and have multifaceted outcomes which really drive the game forward. The idea is that all players must offer up a predetermined number of skill cards of the designated colours on the crisis card in a "vote" in order to resolve the situation. 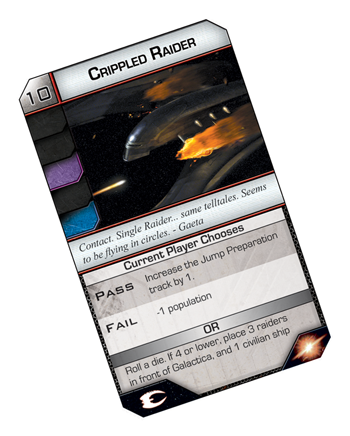 These cards must be played face down so as to the allow the hidden Cylon players an opportunity to secretly play skill cards of the wrong colour in an attempt to fail the crisis resolution - and force the negative effects onto the fleet. Failing a crisis will usually result in the depletion of food, fuel, morale, or population - which are represented by dials on the top right of the board. When just one of these dials reaches zero, it's game over for the humans. Crisis Cards can bring attacking Cylon Basestars - and fighters - into Galactica's airspace, activate them, and cause severe damage to the Battlestar and surrounding fleet if players are unsuccessful in warding them off in Vipers. (Better save those nukes.) 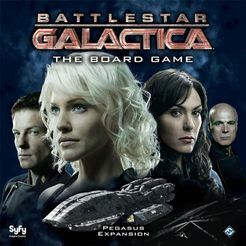 Cylon boarding parties can also be dispatched in a crisis, and if they're able to board Galactica, it could be game over for the humans as well. Certain Crisis Cards have a jump symbol in the bottom right corner, which results in Galactica jumping forward one space on the jump track. When the jump track maxes out, the fleet automatically jumps into hyperspace - fleeing their attackers just in the knick of time. If the situation is just too hot to handle, the crew can attempt a premature jump by activating Galactica's FTL control - at more of a risk to the fleet. 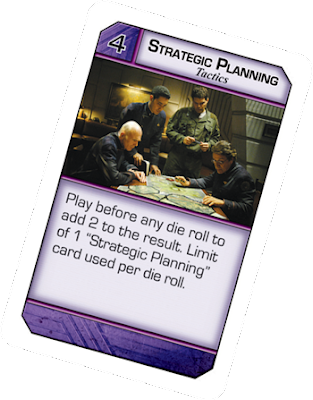 This frantic decision making guarantees some of the most tense and immersive gameplay that BSG: The Board Game has to offer. 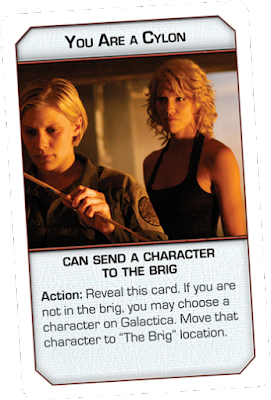 The Sleeper Phase sees players dealt new Loyalty Cards, which may awaken Cylons previously hidden within the fleet - even unbeknownst to themselves. Just when you think the crew is getting it together, it takes only one crisis - and one vote - to burn it all to to ash faster than a supernova. 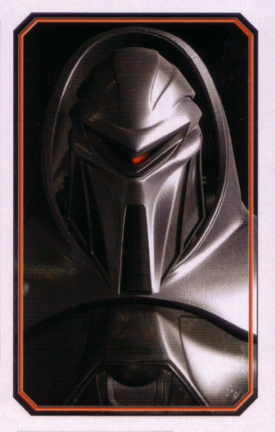 Cylon players can reveal themselves at any time and draw a Super Crisis Card - the effects of which are truly devastating. 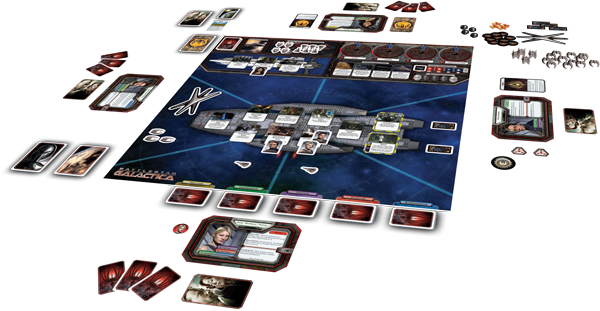 Revealed Cylons must travel to the Cylon fleet section of the board - and must play out the rest of the game using the limited hostile actions available from there. Ultimately, the humans must do everything in their power to strategize and plan their limited turn actions accordingly in order to both manage crisis, and preserve their precious resources against ruthless attack and espionage - at all costs. 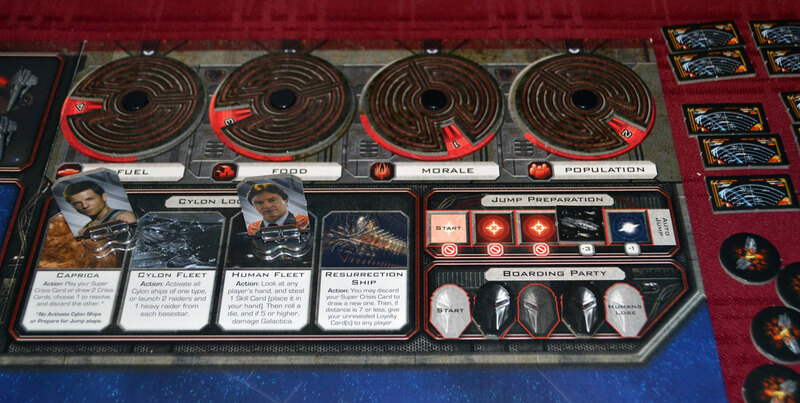 It's the way the mechanics weave the desperate struggles onboard Galactica into a playable experience that really makes this game such a worthwhile endeavour. You can never know who to trust. Will you root out the sleepers or cleverly mask your own treachery? The cards will decide your fate. There are even three available expansions that introduce more playable characters, rules, cards, and scenarios! This expanded opportunity to explore the detailed universe of the series will test the social savvy of this Galactica crew to the max. This game will leave your heart pounding, and your excitement fixated on the edge of your seat. In a classic war for the ages, which side will prevail? When no hope remains, all you can do is fight. So say we all.